Before writing the review, I scoured the internet for expert advice, the experience of users, previous reviews of this sprayer to gather all the information that you will need to make an informed decision. This article is a culmination of all the research. So, by the end of this review, you will have all you need to either purchase this product or pass it on. Who Is this Spray Painter Best Suitable For? Light in weight. This facilitates easy movement of the sprayer from one area to the other. Couple with the fact that the unit is not so heavy when it is full, the construction is quite sturdy and durable. With the design of this sprayer, you can be sure it’ll withstand wear and tear better than other sprayers. And you don’t have to break the bank to get it. Also, the paint gun is also light in weight and is completely made of metal which translates to more service years. Versatile. You can use this sprayer to paint your walls or stain your floors. And remember that you can get great results with minimal efforts with the Graco Magnum X5. I like that you can use it for different projects as long as you have the right combination of paint and painting surface. Easy to use. The instructions that come with this sprayer are easy to follow even for a first time user. The features are very easy to understand and digest especially for beginners. With this, you don’t have to spend hours trying to learn the different features to start working with it. This is even more important if you’re working on a small project. Easy to set up. The structure of this sprayer is compact hence no need for assembling and disassembling before and after use. There are only a few parts to it and you can keep it in tip-top condition by maintaining regular cleaning and servicing. Easy to clean. The cleaning process of this sprayer takes only a few minutes especially when you attach it to your garden hose. Suitable match for bigger projects. Like the Graco Magnum X7, this sprayer is powerful, sturdy and has the capacity to handle heavy duty projects. Easily clogs up. This happens when you use thick materials on it. Luckily, you can simply blow the tip to unclog it. More suitable for outdoor use. This factor limits you as the user. This sprayer may vibrate when used in a higher PSI. It may even move around a bit during use. However, this may go unnoticed and does not interfere with the quality of your work. If you are looking for the ideal sprayer for spraying latex or stain for handling your remodeling jobs, this is it. It is very easy to use and clean and has all the features you will need to accompany you on every project you are doing. Check Price, Reviews, and Ratings for the Magnum X5 Here! Before you decide to buy this sprayer, there are certain things you need to learn about it. If this is your first time reading Graco Magnum X5 reviews, you will definitely find there are lots of things you need to know about this model. Reading through everything in this review will help you understand what this sprayer is about and be able to decide if it’s going to be a good deal for you. Some of the most important things you need to know are here in this section and the next section. The Graco Magnum sprayer is an entry level airless sprayer that helps you get the result of a high-end sprayer. After reviewing a couple of sprayers, it is clear that you don’t get to enjoy this kind of luxury on most sprayers, which is a big plus for this model. In addition, it comes with fully adjustable pressure which gives you absolute control over the paint flow. When you have total control over the flow of the paint from the sprayer, you will be able to maintain a consistent output for any of your projects, regardless of the size. This is an important thing to nail down if you want to get that professional look and finish. You can also spray unthinned paint at higher pressure using the stainless steel piston pump. Thanks to the flexible Suction Tube, you can spray from 1 or 5-gallon paint bucket and enjoy up to 125 gallons per year. The Magnum X5 also allows you to use a hose of 75 ft for that extra reach. You can use the Graco Magnum X5 on ceilings and walls as it does a great job on both. You need to ensure everything is well covered — generally, you mask those things you don’t want the paint to get to. It will also be helpful to have a long wand so that you can reduce the stress of painting ceilings. It is important that you read the user manual to learn how to operate this unit. Moreover, it has a lot of instruction with visual aids and is easy to go through. Also, setup of this model takes longer, compared to using a roller or brush. These are are many features on the Graco Magnum X5 that each one needs to be explained so that you understand what you get with each one. Instead of just throwing the bare features at you, I am going to explain them below for your perusal. The piston pump of the Graco Magnum 262800 X5 is made of stainless steel. When you are buying a spray paint machine, it is important to choose one that has a stainless steel tip as it guarantees durability. This way, you can use it repeatedly without worrying about it going rust or breaking down too quickly. So, the stainless steel tip gives you value for your money because it ensures the X5 lasts longer. Anyone who’s familiar with painting projects knows that the cleanup process could be a tedious process for some paint sprayers. This sprayer is actually easy to clean and only a few users have reported difficulties. However, when you follow instructions that come with the machine, you shouldn’t have too much problem. After a successful DIY painting project, simply attach the power flash adapter that comes with the Graco Magnum X5 to your garden hose to wash off the paint. This further shortens the duration of the entire project since it will only take a few minutes to Clean up and store your paint sprayer away. If you want to cut short the painting task without interfering with the quality of the job then you should choose this airless paint sprayer. This model offers a push-primer feature which works to your advantage. This is a feature that demands even less of your manual input and time. The sprayer makes for a quick and straightforward priming process without increasing the number of repetitions for a satisfactory experience. Unlike paintbrushes and rollers, this product offers you the luxury of achieving the kind of finish you want with your project. Next to the flexible intake tube of the Graco Magnum X5 is the knob that you can use to fine-tune the pressure which gives you the freedom to set it on either low spray or high spray. The highest output that you can go with this is 3000 PSI. Additionally, there also are the roller and cleaning settings all for your convenience. Adjusting the knobs allows you to end up with the kind of finishing that you want: whether too thick or thin. One of the best things about the Graco Magnum X5 is its convenient design and user-friendly structure. This painting sprayer is small in size and compact which allows you to move it around easily. It also comes with a handle that makes it easier to work on longer projects. Unlike those models that use a bucket of paint, this one is designed with a stand that keeps it in a central position, for instance, in the middle of the room as you work around. It’s compact size also facilitates easy storage hence saving on space. The Magnum X5 has a high price-value ratio which means that it gives you a good value for your money. Moreover, you are also buying from a reputable company with good customer service. So, not only will you be paying a decent price to get this, you will also enjoy the quality that comes with that. If you are looking to achieve a medium-thick coating, this feature facilitates that. With 515 tips, you can also achieve a pattern of 10-12 inches in width. Simply turn the tip the other way around and blow it out in case you encounter a clog and continue working. On the handle of this gun is a filter that’s designed to catch larger particles for a better finish. If you’re going to use different materials over time, for instance, stains, latex or acrylic you’d be glad to know that this sole paint sprayer can handle the different materials. This rules out the need for an additional sprayer. However, it is advisable to avoid using certain materials with textured particles and also solvent based lacquer block fillers. 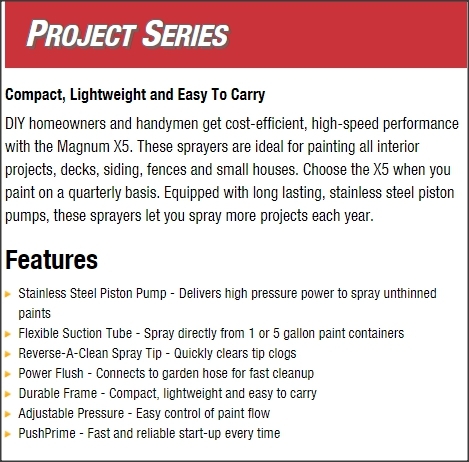 A look at the features of the Graco Magnum X5 Spray Painter shows that this is an ideal choice for home/DIY projects. It has a convenient capacity of 125 gallons a year, which is adequate enough to handle regular paint jobs around your home. Using it on commercial projects will definitely overwork the motor hence likely to encounter a malfunction or complete damage to the sprayer. Keep in mind that the tip of this sprayer works best on latex and acrylic walls due to the fact that they are made using medium or light materials. Latex and acrylic are normally used on walls, fences, siding as well as wood furnishings. This means that with the use of this sprayer, you can keep your home looking fresh and clean. If you are a beginner, using this paint sprayer may prove to be quite a challenge. However, with time you will get used to it and perfect your skills. Once you get the hang of it, you’ll realize how easy and convenient using it really is. It is better not to use textured paint on this model. This is because the tip size of the sprayer is not very big, so using a thick paint may actually result in clogging which may retard your progress. For those who will be looking for the fan tip on this model, it is actually 515. The max tip size as mentioned above is 0.015. It is not recommended to use anything above this if you want to get a smooth flow of paint during your projects. Some customers often wonder if there are differences between Graco Magnum X5 and the LTS 15. They are the same with just a difference in aliases. Moreover, the LTS 15 is made exclusive for Lowes so that is the only difference that exists between them. In terms of the features, performance, pricing, and capabilities, they are the same. You should understand the tip size usable on the Magnum X5 if you intend buying or using another tip with it. For this model, the maximum tip size is 0.015, which can be used for exterior latex paint without any issue. The tip size is rated according to the flow rate of the standard finish tip on the Graco Magnum series. 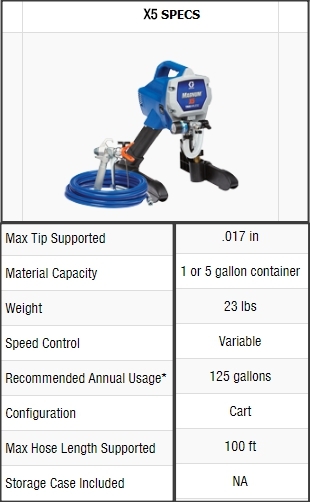 The flow rate of the Graco X5 is 0.27 GPM, so if you intend to buy another tip, you need to examine its flow rate and ensure that it meets that of this sprayer (which is 0.27 GPM) or even exceeds it. If you want, you can get one of the Graco Finish Tips which are available as 515 and 616 and rated at 0.27 GMP (this matches the output capacity of the Graco X5). Also, some paint manufacturers have recommendations for the kind of tip you want to use. For instance, to use the Sherwin-Williams Emerald exterior acrylic satin, the recommended tip size is 0.015 to 0.019 and that is what you must use for any airless spray application. Finally, your tip must not be smaller (which will result in clogging) or bigger (which leads to poor paint finish). If you can, use this model with only water-based materials. The manual says that you can use the X5 to spray mineral spirit based stains and varnishes, but the cleanup is definitely going to be more difficult. The manual cautions that the machine should be well grounded when using this sort of material. This means that there might be risks of fire outbreak. Most users stay with water-based paints because they are easier to clean. 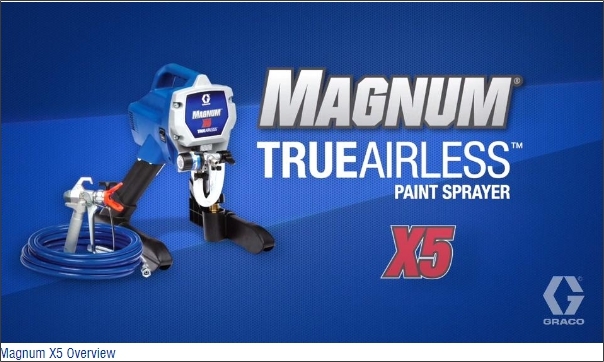 Also, you don’t worry about any hazard when using the Graco Magnum X5 Airless Paint Sprayer. So this means it’s safe for you too. With all the features that are packed in the Graco Magnum X5, you will now be able to enjoy a professional look and finish without paying a handyman to do the job for you. This is why we consider the Graco Magnum X5 one of the best project-oriented paint sprayers you can get for your remodeling jobs (Bonus Point: It is beginner-friendly too).